Even the Leader of the Free World is apprehensive about China's reaction, notes B Raman. Valerie Jarrett, a senior adviser and assistant to US President Barack Obama, accompanied by Maria Otero, the Undersecretary for Democracy and Global Affairs in the US State Department, visited Dharamshala on September 14, and met the Dalai Lama and Samdhong Rinpoche, the prime minister of the Tibetan-government-in-exile. The Dalai Lama is to visit the US next month in response to long-pending invitations from US non-governmental organisations supporting the Tibetan cause. During the course of his stay, he had also planned to visit Washington, DC and his supporters in the US were trying to arrange a courtesy call on Obama. The Dalai Lama and his advisers were hopeful of the courtesy call materialising despite opposition from China. This was the first time that a team of US officials including a presidential aide had visited Dharamshala before a planned visit by the Dalai Lama to Washington, DC. This gave rise to euphoric expectations in Dharamshala that the US officials were coming to finalise the details of a meeting with Obama. There was considerable disappointment in the Dalai Lama's entourage when it turned out that the two officials had specially flown to Dharamshala to request the Dalai Lama not to visit Washington, DC before Obama's first visit to China scheduled for November. Obama is reportedly worried that any meeting with the Dalai Lama before his visit to China might spoil the atmosphere for his talks with the Chinese leaders. The two officials are reported to have sought the Dalai Lama's understanding for Obama's inability to meet him. They are also reported to have promised that during his talks with the Chinese leaders, Obama would take up the issue of the revival of the dialogue between Chinese officials and the Dalai Lama's aides and that he would inform the Dalai Lama of the results of his talks on Tibet in Beijing after his return to Washington, DC. 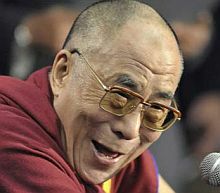 They said a fresh date for the Dalai Lama's visit to Washington could be discussed after the president returns from China. The Dalai Lama is going ahead with his plans to visit Arunachal Pradesh in November, which could more or less coincide with Obama's visit to China. The US officials were reported to be worried that the Chinese anger over the Dalai Lama's visit to Arunachal Pradesh might come in the way of the success of Obama's promised efforts to persuade Beijing to resume its dialogue with the Dalai Lama. It is not clear whether they gave any advice in this matter. It is also not yet clear whether the Dalai Lama will go ahead with his visit to Washington, DC next month to meet his Congressional supporters or cut it out of his itinerary in the US.